Carnation Bouquet comes up with dark pink flowers which fade from bicolor to very light pink in the same week. It’s absolute fabulous to follow the change of colors. The well shaped flowers are carried by floppy stems. No side buds. Very exclusive and hard to get. 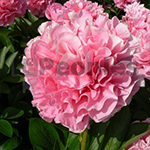 Carnation Bouquet is an excellent Peony for cut flower production as well for use in landscaping.